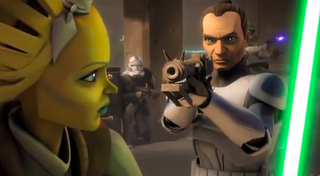 This Week's TV: Clone Wars' final season! Plus, who is the Yellow King? This is a week of hellos and farewells, with the premiere of the non-zombie back-to-life series Resurrection, the return of both Once Upon a Time shows, and the season finales of Almost Human and True Detective. Plus, the final 13 episodes of Clone Wars hit Netflix, revealing the secrets of Order 66. Catch the latest clips and details below. Det. Kennex (Karl Urban) and Dorian (Michael Ealy) investigate a string of murders by a copycat of a serial killer whom Kennex's father (guest star John Diehl) put in jail. As the investigation unfolds, biotechnology from the future sheds light on crimes of the past. Meanwhile, Dorian receives his performance evaluation since being reactivated. It's the tenth anniversary of "Arrival Day" and the town is preparing a commemoration for the fallen soldiers. Gloria (guest star Victoria Platt) selects a small group of human teenagers who will spend some time inside the sector to see what it's like to be an Atrian for a day. In addition, Gloria assigns Emery (Aimee Teegarden) the task of filming the interactions. While Grayson (Grey Damon) offers to help her with the project, Roman (Matt Lanter) strongly objects to Emery going inside the sector. Despite Roman's concern for her safety, Emery decides to move forward with the project. While Sophia (Brina Palencia) is excited to show everyone around her pod, Teri (Chelsea Gilligan) and Drake (Greg Finley) resent the intrusion and decide to have a little fun at the humans' expense. However, when Drake is kidnapped during the tour, he's surprised by who is behind the abduction. Meanwhile, Julia (Malese Jow) confronts Roman with her suspicions about cyper. Elena and Clay need to race against time to save a dying Jeremy. Feeling pulled between her current boyfriend and her ex, Cat (Kristin Kreuk) has to decide between Gabe (Sendhil Ramamurthy) and Vincent (Jay Ryan). While Cat and Vincent work together to save Sam's (guest star Tom Everett Scott) latest victim, Cat's decision gets complicated when she and Vincent find themselves in a compromising situation. Sally finds herself trapped in the past and tries to prevent her own death, but her actions cause a ripple through the present-day lives of her roommates. Danger Zone! Kenny Loggins is finally going to guest star on Archer, where he'll be forced to sing a duet with Cheryl/Carol/Charlene at Lana's baby shower. When Gabriel's memory is wiped clean after CyberCom is attacked by an aggressive virus, he believes Jin Cong is the good guy and helps him locate a top-secret document. This week's episode is titled "Groundhog Fae," which means Bo is going to get stuck in a time loop. Meanwhile, a package causes tension between Dyson and Lauren. Is there a way for Scott to save Stiles? There may be a clue in the story of a World War II internment camp. Meanwhile, Kira discovers that she has unusual abilities. Bill Paxton joins S.H.I.E.L.D. for the run of episodes branded "Uprising." We've already uncovered some of the mysteries behind Coulson's resurrection, but what more will we learn in "T.A.H.I.T.I."? Coulson goes on the attack to save Skye - enlisting the aid of Ward's former S.O. John Garrett (Bill Paxton) — and uncovers shocking truths about his own life and S.H.I.E.L.D. What will The Originals teach us about life this week? That magical curses will drive people to do desperate things. Go figure. In a series of flashbacks to 1919, Klaus (Joseph Morgan) opens up to Cami (Leah Pipes) and reveals details of the devastating secret Rebekah (Claire Holt) and Marcel (Charles Michael Davis) were trying to keep from him. Elijah (Daniel Gillies) forms an unlikely alliance with Monique (guest star Yasmine Al Bustami) and asks for her help in locating Sabine (guest star Shannon Kane.) Elsewhere, Thierry (guest star Callard Harris) is reluctant to get involved when Marcel and Rebekah approach him with a plan to take down the witches. Meanwhile, in the bayou, Hayley (Phoebe Tonkin) is at her wits' end and holds Sabine hostage in an attempt to get information that will reverse the curse on Phoebe's werewolf clan. It sounds like this week, Supernatural is borrowing from the Internet's creepypasta urban legend, the Slenderman. The good news: the Ghostfacers are back! The bad news: someone felt compelled to add a hashtag to the episode's title, "#Thinman." A teenage girl (guest star Ali Webb) is killed and the final selfie she took before the attack shows a ghostly figure in the background. Looking for something to keep them busy, Dean (Jensen Ackles) and Sam (Jared Padalecki) head to Washington to find the ghost. While the two interview the girl's mother, Betty (guest star Maria Marlow), they are surprised when she starts talking about cold spots and fritzing. When they ask her about bringing up paranormal signs, Betty replies that the "supernaturalists" who called earlier brought it up. Enter Harry (guest star Ryan Moss) and Ed (guest star A.J. Buckley), the famous supernaturalists. What was Finch's operation like before he teamed up with Reese? We learn this week when present-day events have ties to Finch's past. Oliver (Stephen Amell) is shocked when he learns that Slade (Manu Bennett) has come to Starling City. Back on the island, as Oliver, Slade and Sara (Caity Lotz) prepare to take over the freighter from Ivo (guest star Dylan Neal), Sara pulls Oliver aside and tells him he needs to kill Ivo to prevent him from telling Slade what happened with Shado. Oliver feels immense guilt over the situation but realizes Slade's growing rage from the Mirakuru makes him unpredictable and he could turn on his friends if he thinks Oliver is to blame. Oliver agrees to kill Ivo and the battle begins. Aaron (Zak Orth) awakes to find himself in a world with power, married to Priscilla (Maureen Sebastian) and running his company. As he gets the feeling that something isn't quite right, familiar faces begin to appear. Professor Hickey may have the right idea when it comes to Greendale's hijinks: go survivalist to avoid the lunacy. Dean Pelton (Jim Rash) invites two designers to Greendale to beta test their new social networking Application. What starts as a fun social interaction of ranking classmates turns into an all-out class war as Greendale students compete for the highest score. Jeff (Joel McHale) and Shirley (Yvette Nicole Brown) battle for supremacy, while Britta (Gillian Jacobs) rails against the very concept. Meanwhile, Professor Hickey (Jonathan Banks) goes underground - literally - until the whole thing blows over. The Knave is released from the bottle by Lizard and she is given the opportunity to make her dreams come true with three wishes. Cyrus, and a reluctant Alice, partner with the Red Queen to find and rescue the Knave, while the Red Queen is captured by peasants who want payback for her cruel reign. Meanwhile, Jafar has taken over the Red Queen's castle and learns of a fearful creature called the Jabberwocky who he plans to ally himself with. Required reading before watching this week's episode: Meghan McCarron's interview with Kelly Link about why The Vampire Diaries is so successful in the way it plays with tropes. While Nadia (guest star Olga Fonda) remembers her centuries-long search for her mother, Stefan (Paul Wesley), Caroline (Candice Accola) and Matt (Zach Roerig) come up with a desperate new plan to save Elena's (Nina Dobrev) life. For the second time, Bonnie (Kat Graham) and Jeremy (Steven R. McQueen) must turn to Liv (guest star Penelope Mitchell) for help. Damon baits Tyler (Michael Trevino) into a nasty confrontation, then takes off to seek revenge on Dr. Wes (guest star Rick Cosnett). Caroline and Tyler come to a new understanding. Finally, Bonnie learns of a terrifying secret that will threaten the lives of all her friends. Viking alliances may be good for vikings, but they're bad for the English. Four peaceful years have since passed with Ragnar as Earl. The time has come for an unlikely alliance to band together in pursuit of a common goal–a new raid on England. A storm pushes the Viking fleet to a new destination, and on the beaches of Wessex, Ragnar and his men may have met their match. The full 13-episode sixth (and final) season of Clone Wars comes to Netflix on Friday, and it answers some of the questions raised by the films. We start off with a Clone Trooper neurological misfire that threatens to reveal Order 66 ahead of schedule, and we'll end with Yoda, whose encounter with a ghostly Qui-Gon Jinn sends him on a quest to understand the nature life after death. This final season is sadly lacking in Ahsoka and Asajj, however. Is there a baby-stealing Wesen on the loose? Alan and Julia head to a nearby outpost as Jordan's condition deteriorates. But there are in for a surprise when they get there. This week's episode is "There's Always Tomorrow, Baby." Otherwise, it's a good night to binge-watch Clone Wars. After Rumplestiltskin sacrificed his life to stop Pan from enacting another curse, Regina obliterated her original curse, which erased Storybrooke from existence and whisked its residents back to Fairy Tale Land - leaving Emma and Henry back in our world with no memories of Storybrooke. But all is not well back in the Enchanted Forest when Hook comes calling on Emma in New York City in an attempt to jog her memory so that she can once again help her fairy tale family and friends out of a desperate situation. In "The Returned," an 8-year-old American boy (Landon Gimenez) wakes up alone in a rice paddy in a rural Chinese province with no idea how he got there. Details start to emerge when the boy, who calls himself Jacob, recalls that his hometown is Arcadia, and an Immigration agent, J. Martin Bellamy (Omar Epps), takes him there. The home he claims as his own is occupied by a 60-year-old couple, Henry (Kurtwood Smith) and Lucille Langston (Frances Fisher), who lost their son, Jacob, more than 30 years ago. While they look different, young Jacob recognizes them as his parents. Lucille is overjoyed at the seeming miracle of her son's reappearance. Henry is reluctant to accept that Jacob is back. Those closest to the family want answers, including Sheriff Fred Langston (Matt Craven), whose wife Barbara drowned 30 years ago while trying to save Jacob, and Fred's daughter, Maggie (Devin Kelley), a local doctor. Pastor Tom Hale (Mark Hildreth) seeks a spiritual reason for what's happening in his community. When things take an even more shocking turn, Maggie's life-long friend, Elaine Richards (Samaire Armstrong), finds herself drawn into Arcadia's growing mystery. One group of survivors finds shelter, while it looks like another group is left in the fog. In the present, 17 years after first investigating the Dora Lange murder, Hart and Cohle find that an overlooked detail provides them with a new break in the case. Who will be revealed as the Yellow King?